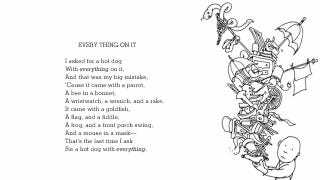 A new book by Shel Silverstein has been released posthumously called Every Thing On It and is in book stores today! The book, containing 145 poems, was created though the efforts of editor Toni Markiet and the family of the deceased poet, in hopes of staying true to Silverstein's aesthetic and keeping it authentic. "He would move a piece of art over an 18th of an inch ... and look at how it looked on a page," she recalls. "It's a slight adjustment, but to him, it mattered. I think one of the reasons his books are still so immensely popular after almost 50 years is that every tiny detail was considered. "I think he liked to mix it up, so that a child or any reader would never be bored. You could let it open at any page and you would be entertained." For someone else to scrub. Some stuff 'em in a sack.